It's a victory for high-concept children's books over science once and for all, as Chris Gall's "what if dinosaurs were also trucks" book Dinotrux has been optioned by Dreamworks Animation. 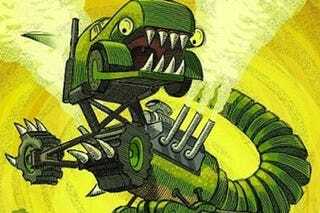 Millions of years ago, DINOTRUX ruled the earth! These mighty part-truck, part-dino creatures rumbled, plowed and bulldozed their way through the centuries, demolishing anything in their path. From the nosy Craneosauraus and the mega-hungry Garbageadon to the bully of the jungle, Tyrannosaurus Trux, Chris Gall guides you on a safari through the wild world of these mechanical monstes of prehistoric times. So buckle up for the ride—you'll never look at Dad's rusty old pickup the same way again! This curious mash-up of Transformers and... well, Transformers' Dinobots has captured the heart of Dreamworks Animation, who paid a six figure sum for the rights to the book, presumably with an eye to a new multi-movie franchise and attendant toyline. Where's the animation world's Michael Bay when you need him?